Besides the default placeholders, you can also create custom fields to be used as placeholders in your templates. Placeholders help you personalize your emails. While creating an email template, insert the placeholders in your emails and Klenty will automatically replace them with the prospect’s information. Klenty has default prospect fields that can be used as placeholders. Here’s how you can create custom fields to then use them as placeholders in your email templates. You can create custom fields for prospects if you need additional fields. Here’s how you can add a custom prospect field and use it in a template. Go to Settings and click on Custom Fields in the Prospects section. Insert the name of the fields and click on Save. Once done, make sure to insert values into these fields while importing your prospects. While creating an email template, use the placeholder icon on the toolbar to view the list of default and custom fields. You can use User Custom Fields to create placeholders for certain words that you use in your emails that will be unique to each user in a team. Note: 1. These aren’t part of your prospect fields and will not replace prospect field placeholders. 2. If you share templates with team members, then the placeholders will be replaced only if they have created the custom field as well. 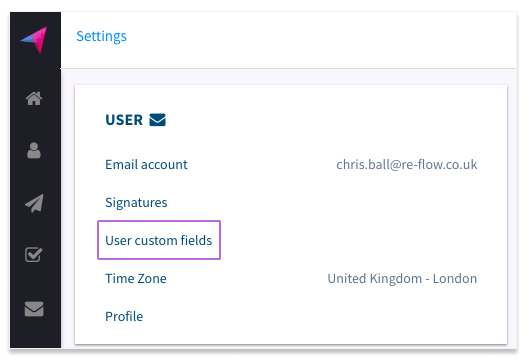 Here’s how you can add a custom user field and use it in a template. Go to Settings and click on User custom fields in the User section. In Field – enter a name of your choosing. In value – enter your unique value. Your team members will need to repeat these steps and enter their unique value here. Click on Save once done. While creating an email template, use the placeholder icon at the toolbar and click on the user fields tab to insert the fields you created.